Travel soccer is a competitive level of soccer whereas in-house is recreational. Travel soccer starts at the U10 age level, and can continue through high school. Travel soccer is the next level of soccer after our in-house league and includes an increased focus on the technical and tactical development of players. A high level of commitment to the team is required to participate in this program. The program provides talented and promising players enhanced exposure to the game, the opportunity for additional coaching and the chance to compete against teams of similar talent. DIV. 4 teams will compete in the highest level of play on Sunday and can travel to areas outside of the South district. CVSA will hold evaluations for placement on any age group that have multiple teams, players that do not qualify for D4 placement will be placed on one of CVSA's D5 or D6 teams. CVSA travel are recommended to participate in the PA West Open Tournament at Edinboro University . Any CVSA team that rosters 4 or more Classic players will be required to play D4 per CVSA Board. Travel Team participants will need to purchase an Under Armour uniform IF THEY DO NOT already have one. The United States Soccer Federation (U.S. Soccer) has announced changes to youth soccer that will affect travel soccer teams across the United States beginning in August 2016. These changes will impact our CVSA 2016-2017 Travel Teams starting this fall. The biggest requirement is the change to “birth year eligibility”. For example, past Under 12 travel teams were comprised of players born between August 1, 2003 and July 31, 2004. Starting with Travel team placements in May, the age group cutoff will switch to January 1st for all age groups. So for next year’s Fall and Spring soccer season, the Under 12 age group will be comprised of players born in the year 2005. Put simply, teams will now be comprised of players sharing the same birth year. This change will take place throughout the United States. The main purpose of this change is so that our country uses the same age groups as all other countries that play organized soccer. 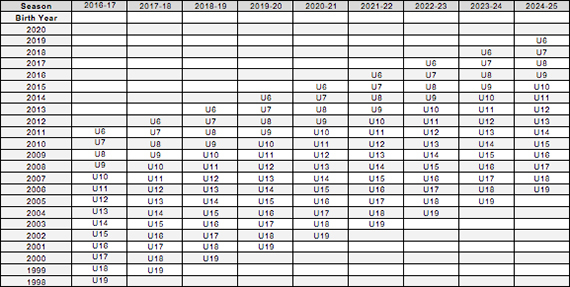 Travel teams will be formed by birth year according to the chart listed below. All players will be placed on the appropriate team according to the chart below. Please do not request to be placed on a team other than your child's birth year. CVSA will not be able to honor requests until registration is closed and we can determine roster size per teams. Travel playing season begins with the fall session ( Sept-Oct) & will end with the spring session (April - May).